The cost of buying bird cages for our pets can be quite expensive. Expect to pay from several hundred dollars for smaller birds and several thousand dollars for larger macaws. One way that you may try to reduce the cost of providing your bird with a suitable cage is to investigate the availability of used cages. While you can save a substantial amount of money by purchasing a used cage for your pet, there are some considerations that need to be taken when going this route. You certainly don’t want your bird to have to endure potential health risks in the quest to save a few dollars. Here is a quick checklist of questions to ask when looking into buying a used bird cage. What happened to the birds that used the cage? Has the bird cage been altered at all? What materials were used to construct the bird cage? Is the old design of the bird cage still bird safe? How am I going to clean the used bird cage? According to Bird-Cage.com, there have been reports of birds getting sick and dying after being housed in used cages even after they were sanitized and cleaned. This is due in large part to the way cages are constructed and there being many hard to reach areas where bacteria can grow. If the cage housed birds that suffered from a communicable disease then it is not suitable for your pets. This critical fact may be the differentiating factor in taking a chance on a used cage. If the cage has been refurbished or repainted you need to ascertain if the materials used were bird safe. The cage could have been recently painted to make it more presentable. The seller may not be aware or could not care about the harm that using the improper paint can have on the inhabitants of the cage. Lead, which should be avoided at all costs in pet birdcages, can be found in some antique cages. These cages were constructed before the negative health effects of this toxic metal were known. Any cages that are suspected of containing lead wire should be avoided. 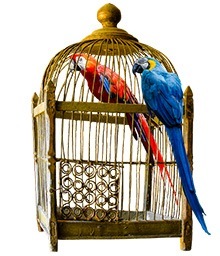 Antique or vintage bird cages, often found in antique stores or yard sales, can be highly decorative and offer a more distinctive look than the commercial cages that are available today. Unfortunately, these qualities do not outweigh the potential problems that can be associated with an antique birdcage. The ornate nature of many of these cages is what appeals to the human eye but may pose a danger to the cage’s avian inhabitant. Intricate scrollwork and sharp edges are prevalent on many antique bird cages and present opportunities for your bird to get injured. The shape of the cage is also often not suitable for actually keeping a bird. Vintage cage design did not always stress the best interests of the bird over creating visually attractive cages. In order to provide the safest environment for your pet bird with a used bird cage, you need to clean it thoroughly before use. The best way to do this is by bleaching the whole cage with special attention to the corners and crevices where bacteria may linger. Follow this with another cleaning with soap and water. You may want to repeat the process, but then always end with a final rinse and allow the cage to air dry. The risks inherent in trusting your precious bird’s health with a used bird cage probably outweigh the financial benefit of buying a second-hand cage. 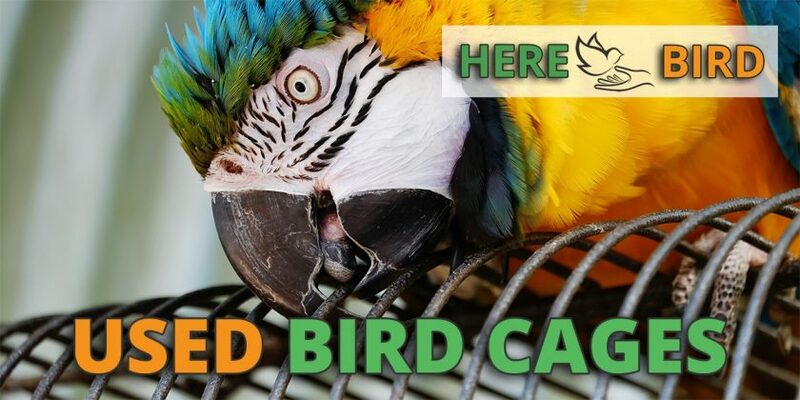 Before taking on the responsibility of bird ownership, you should make sure that you can afford it, and buying a quality cage is one of the first steps you will need to make. Below is a video warning of some of the dangers of a used bird cage.